This past week/weekend was incredibly busy for the three of us. 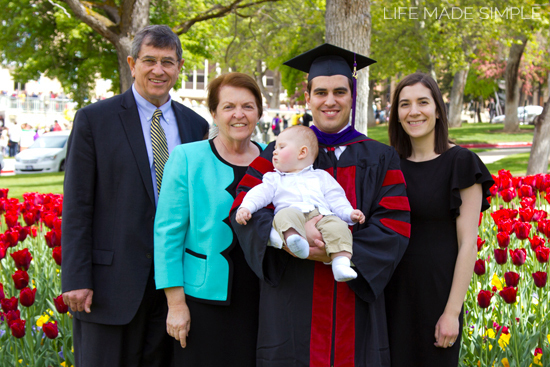 We had lots to celebrate: Mother’s Day, a birthday, and most important, Stephen’s graduation. That’s right, 3 years and several clinics, papers and exams later, he’s officially done with law school! We couldn’t be more excited!!! After all of the graduation festivities were over on Friday, we came home, relaxed, and then went to dinner with friends and family. The following day I decided to surprise Stephen with a little party. I made him this red velvet cake with vanilla bean cream cheese frosting. It’s the cake version of these delicious cupcakes I made back in February. 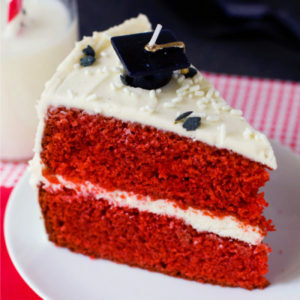 Since he went to the University of Utah I thought that red velvet would be perfect. I found some cute sprinkles and a candle for the top. I will warn you though, I only had 10 minutes to assemble, frost and decorate the cake, so if it doesn’t look perfect, it’s probably not! For the cake I doubled the recipe for my red velvet cupcakes. I made a few alterations along the way, so make sure to follow the recipe below if you are going to make this as a layered cake. To start, cream together the butter, sugar, vanilla and food coloring until light and fluffy. Creaming will help add air which helps the cake rise and become light and fluffy. I usually cream my sugar and butter for 2-3 minutes or until it becomes pale. Then add the vegetable oil and the eggs one at a time until incorporated. Now in a medium size mixing bowl combine all of the dry ingredients with the exception of the baking soda. 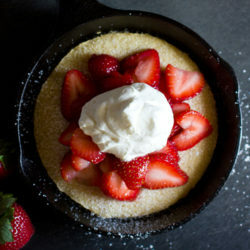 Once you’ve whisked them together you can turn on the mixing speed to low and alternate adding the dry and wet ingredients (this will help prevent the batter from curdling)- those wet ingredients include full-fat buttermilk and full-fat sour cream. When the batter is smooth and no flour pockets remain, it’s time to add in the vinegar and baking soda. Just mix it together in a little bowl, pour it into the batter and beat the mixture for about 20 seconds or until it’s full incorporated. Pour the batter into the prepared pans, dividing the mixture evenly. Place the pans side by side in the preheated oven and bake. Here comes the tricky part. Every oven is different and everyone bakes at a different altitude. In California or Florida it usually takes me a bit longer to bake a cake, however here in Utah I find that whenever I made a tried and true cake recipe (usually a family one), it needs 10-15 minutes less than the recipe states. So… bake this cake for AT LEAST 25 minutes, but know that it could take the full 30. Please keep an eye on your cake and check for doneness. Trust me, on more than one occasion I’ve thought “oh it says 45-50 minutes, I can come back around the 40 minute mark to peek.” Bad idea. They were always dry and toasty. Moral of the story- just hang around and be patient, you won’t regret it! When you see that the cakes are done (or have inserted a cake tester into the centers), remove the cakes from the oven and allow them to cool for 30 minutes before removing and placing them on a wire rack to cool completely. Once the cakes have cooled, prepare the frosting by creaming the butter, vanilla and salt, then slowly adding the powdered sugar. This will create a fondant-like mixture. Add the cream cheese and heavy cream at the very end and mix for 1 minute and 30 seconds on the lowest speed possible. 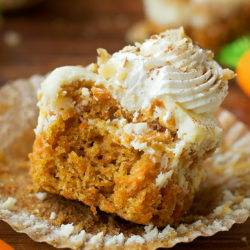 I’ve found that this method yields a thick and stable cream cheese frosting, one that you can pipe or spread that won’t run all over the place. It’s the best! Now all that’s left to do is assemble the cake. I think that’s pretty straightforward. I chose to garnish mine with festive graduation sprinkles, but feel free to leave the cake as-is or add sprinkles, crumbs or nuts. This red velvet cake with vanilla bean cream cheese frosting is perfect for any occasion and tastes great with a big glass of milk. Allowing the cake to rest overnight will intensify the flavor, leaving you with an even more decadent and rich cake that is absolutely divine! Enjoy and happy baking! 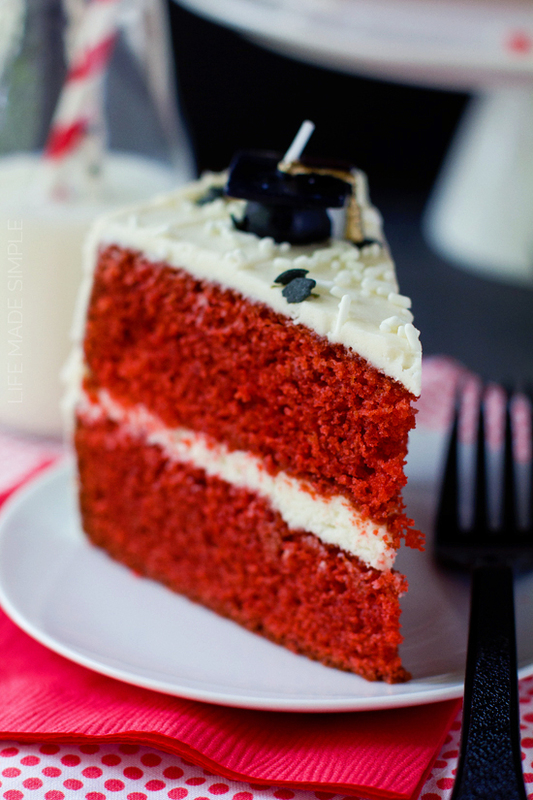 Classic red velvet cake topped with vanilla bean cream cheese frosting. 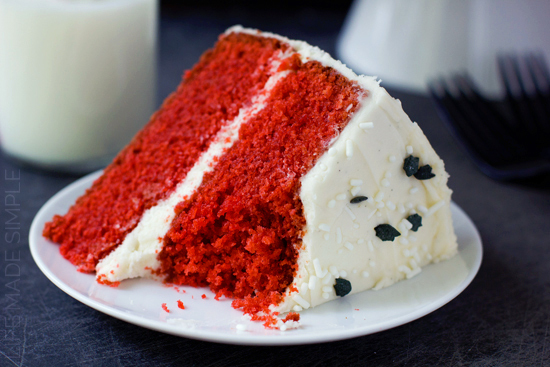 It's super moist, soft, and of course bright red! 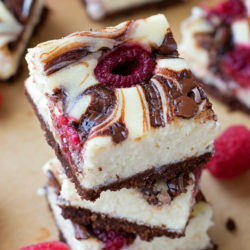 The buttermilk and cocoa in the cake pair perfectly with the tanginess of the cream cheese. It's a match made in heaven. Preheat oven to 350 degrees. Line the bottoms of (2) 9" round cake pans with parchment paper, then butter and flour the pans, set aside. In the bowl of a stand mixer fitted with the paddle attachment, cream the butter, sugar, vanilla and food coloring until light and fluffy, about 3 minutes. With mixing speed on low, add the oil, then the eggs one at a time, beat for 30 seconds on medium speed or until incorporated. In a medium size mixing bowl whisk together the cake flour, cocoa powder, and salt. With mixing speed on low gradually alternate adding the dry along with the sour cream and buttermilk, mix just until combined. Pour the baking soda into a small bowl along with the vinegar. Mix together then beat into the batter, about 20 seconds on medium speed. Pour the batter into the prepared pans, dividing evenly. Place in the oven and bake for 25-30 minutes or until the tops are firm and a cake tester inserted into the center comes out clean. Remove from oven and allow to cool in the pans for 30 minutes before turning out onto a wire rack to cool completely. Meanwhile to prepare the cream cheese frosting, using the paddle attachment cream the butter, vanilla and salt for 3 minutes or until light and fluffy. With mixing speed on low gradually add the powdered sugar, beat until it forms a fondant-looking ball. Add cream cheese and heavy cream, mix on the lowest speed possible for 1½ minutes, then STOP! Place in refrigerator to chill for at least 15 minutes to set up. Allow to stand at room temperature for 5 minutes before frosting the cake. Start by frosting the first layer, set the second layer on top and then frost the top of it along with the sides. Sprinkle with desired sprinkles or pipe decorative details. -This recipe easily makes 24 standard size cupcakes. Bake for 18-22 minutes. -I've recently become a huge fan of Wilton's Bake Even Strips. They fit around the outer edge of your pans and ensure that the cakes bake up level or even. If you do chose to use these, you won't have any excess cake to level/use for decorating crumbs. I just love a classic velvet cake and the graduation cap is a great touch! Congrats! Thanks Bill! It was a fun cake to make for such a special occasion! I’m from Kenya and I love this recipe!!! It’s so light and fluffy.It’s my first time making cinnamon rolls and will now try you red velvet cake.